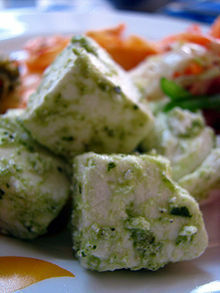 Paneer is a fresh cheese of Indian origin. It is a non-melting food that does not use rennet, making it appropriate for a lacto-vegetarian diet. Paneer can easily be made at home using household ingredients and equipment. On the stove, allow your milk (and salt, pepper and/or butter, if necessary) to heat up to just below boiling (i.e. when the milk goes frothy, but before it bubbles) and then turn off the heat. Add the vinegar or citric acid one teaspoon at a time and stir frequently. Eventually, the milk will curdle and the solid curds will separate from the watery whey. Allow the curds and whey to cool, so that they are still warm but cool enough to handle, and strain them through the cheese cloth. The curds will be left in the cheesecloth, while the whey will be passed through. If you like, you can keep the whey to use in place of vinegar next time you make cheese. This will produce a more tender cheese. Rinse the curds with fresh water, wrap them in the cheesecloth and squeeze tightly to ensure all the moisture is removed. Less moisture will result in a firmer paneer. The cheese is now ready to eat. You can improve its appearance by placing it in a cheese mould or by soaking it for two to three hours in water. Otherwise, enjoy!